Aleksei Davydov died this morning, a little after 5 AM, in a Moscow hospital. He was 36 years old. I only met him twice, at Moscow Pride in 2006 and 2007. He was softspoken, with a clipped, quick way of talking, something that made him seem rather more frail and willowy than he actually was. He was also, in my experience, kind and helpful, with a close grasp of detail – he gave a lot of assistance to myself and ILGA-Europe in researching our 2007 report on the Pride arrests. He had no great passion for fame and the center stage, and when he fought internecine wars, which everybody in the Russian dissident movements does, the battles tended to be short and to the point. He cared more about getting things done than about who does them. He worked closely with Alekseev for the most part over the years, one of the few activists of an independent reputation who managed to do so. At the same time, he kept his distance from Alekseev’s more offensive antics, and tried to sustain relations between LGBT activism and the democracy movements. I didn’t always agree with him, but I respected him. He was known as the person around Alekseev you could actually talk to, and as someone who had a moderating influence on the always-enraged leader. Sometimes they had spectacular fallings-out. In 2009, Alekseev even threatened to sue the producers of a German film about Moscow Pride because it included interviews with Davydov, whom Alekseev was then accusing of “undermining the LGBT community.” Later, though, the two patched up whatever had caused the breach, and cooperated regularly if not uniformly till Davydov died. 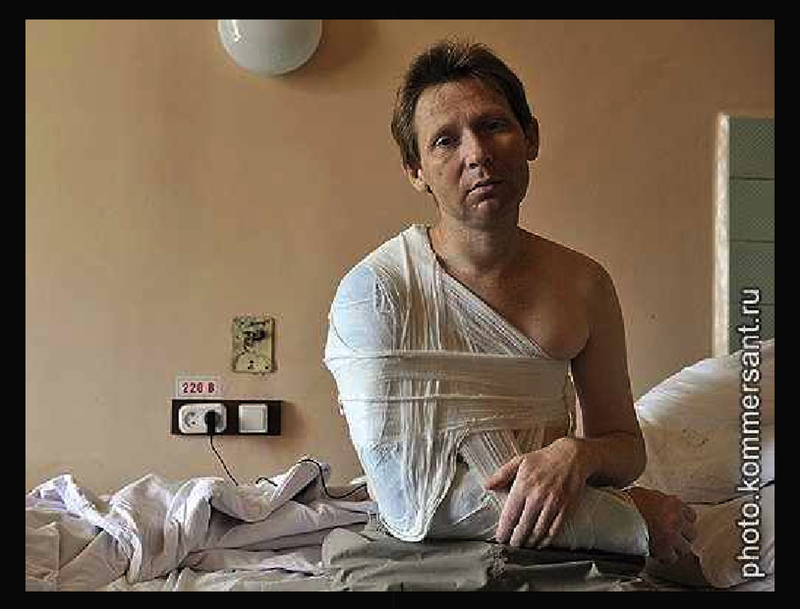 he was arrested, in 2011, at a meager protest to defend Russians’ rights to free assembly … and, in the process, had his arm so severely broken that he required a month’s stay in the hospital. Davydov, a diabetic who was on dialysis, contracted an infection which led to kidney failure, his friends say. By the end, his health was so frail that, on a recent visit to Voronezh to protest gay discrimination there, a bout of food poisoning sent him into his first coma. All the while, he kept protesting. This July, he and a few other activists unfurled an anti-homophobia banner in Red Square. They were arrested. In August, he took part in a small rally on the same spot, protesting at the 45th anniversary of the Soviet invasion of Czechoslovakia, with a flag that read “For our Freedom.” He and nine others went to jail. 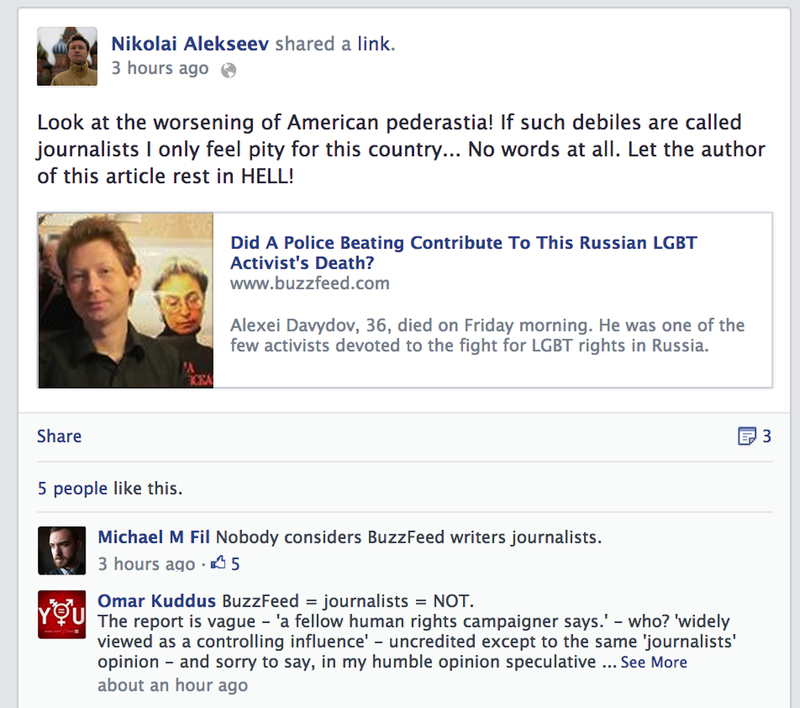 He seems to be angry because the article said Davydov “was a leading Russian LGBT activist and widely viewed as a controlling influence on the movement’s most prominent and mercurial figure Nikolai Alexeyev.” Probably both statements offend the prominent and mercurial man. But they’re true. If Davydov had had more space to do his own work instead of moderating Alekseev, the movement might be stronger today. But what matters is that he was there; both the pro-democracy and LGBT rights causes drew strength from him, and drew closer to each other. Not more than a week ago, my organization in Liski planned to organize a demonstration to celebrate the 15th anniversary of the Russian Constitution. Basically, a sort of anniversary of the date when what we can call “Modern Russia” resumed in 1993, with democracy, civil liberties, rights, freedom. 30 of us were ready to go on the streets of this little provincial city which never saw anything from “Putin’s miraculous economic boom of the last 8 years.” It resulted that in the next 2 days after we applied for the march, we were arrested and detained by the local police twice; one of the organizers and his parents were seriously threatened by the mayor of the city and might be sacked from his school; our contact details were passed to neo-Nazi groups; and last but not least — our event was banned. Instead, a march in support of the current regime was organized by the city authorities. Local schools were asked to send participants by the city authorities. The same who accused us of trying to pervert the local youth forced 200 teens to participate in this local masquerade that equals practices known in North Korea, China, or Vietnam. I respect the memory of those who suffered tens of years ago. Especially that many heterosexuals were accused of being homosexuals by the Soviet [Union], only to be sent far away from the cities where they would not be a threat for the dictatorship. But I also would like that someone remembers also that today, many people suffer. And I don’t want the current regime to give an impression of kindness, to pay tributes to the victims of the Soviet state, while today it keeps persecuting us! Every day, we fight to end this present persecution that we all, gays and heterosexuals, defenders of civil liberties, face in modern Russia. P.S. Sadly, Aleksei Davydov left no close relatives. His friends are trying to raise money for his funeral expenses. If you want to contribute, information can be found on Julka Bashinova’s Facebook page here — if you’re not a Russian speaker, you can use Google Translate or contact Julka directly through Facebook. Nikolai Alekseev is also attempting to raise money through his PayPal account, but I would recommend going to Julka instead. This entry was posted in Human Rights, LGBT Rights, Politics and tagged Aleksei Davydov, anti-propaganda law, Doug Ireland, Gay City News, Liski, Moscow Pride, Nikolai Alekseev, Putin, Russia, Scott Long, Solidarnost by scottlong1980. Bookmark the permalink. Thank you Scott. RIP Alexei Davydov.